What a fun day in DC at the YMCA, the WCSC, and on Mt. Pleasant Street for a scavenger hunt. I developed my understanding of business and broadened my cultural horizon. In November, 51 students — mostly first-years and sophomores — headed north to Washington D.C. for morning meetings with entrepreneurs, business executives and nonprofit administrators. In the afternoon, they explored the Columbia Heights neighborhood in small groups on a scavenger hunt, snapping pics of local landmarks to show their finds, before heading back to Harrisonburg. 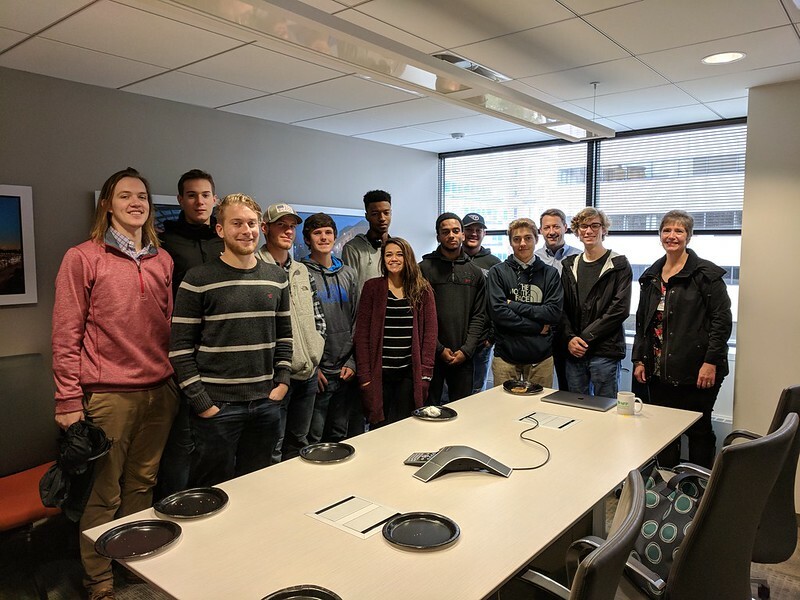 Such field trips help more students benefit from deep connections built in the city through EMU’s Washington Community Scholars’ Center (WCSC), which offers semester and summer programs that integrate internships and the urban cross-cultural experience. The visits also encourage students to imagine how they could gain hands-on experience through an internship. “I hope the students got a taste of the many career opportunities available to them through WCSC and also how lively, diverse, and fun D.C. is, even on a cold and extremely wet day,” said WCSC Director Kimberly Schmidt. Each of the five business leaders who volunteered their time have ties to WCSC and EMU, whether through hosting of interns, employing graduates, and/or the sharing of common goals related to social change. Students came away from discussions and site visits moved by their dedication and passion and inspired by the overcoming of personal obstacles and risk, Schmidt said. Restauranteur Andy Shallal talked about how the Busboys & Poets mission statement (he actually calls it a ‘tribal statement’) helps to create a site for dialogue and progressive gatherings. Shallal’s not-so-straight career path (he was formerly an immunologist) and many interests affirmed in a positive way sophomore James Dunmore’s feelings of uncertainty about his own future: “What Andy’s story showed me is that we cannot fully plan out our futures and doing so could close off meaningful opportunities down the road,” Dunmore said. For first-year Ben Greenleaf, hearing from Tony Parchment how the partners of technology firm Buchanan & Edwards took the risk of quitting their jobs to work towards their dream of starting their own business “made a huge impact.” Parchment also spoke about the power of coaching, mentorship and networking to move young businesspeople forward (in 2017, he founded the nonprofit Upstart Connectors to help talented but under-resourced professionals). From David Deal, a partner at Build Consulting, they heard about the risks of starting a business and handling failure, as well as running a healthy workplace that prioritizes employee wellbeing. 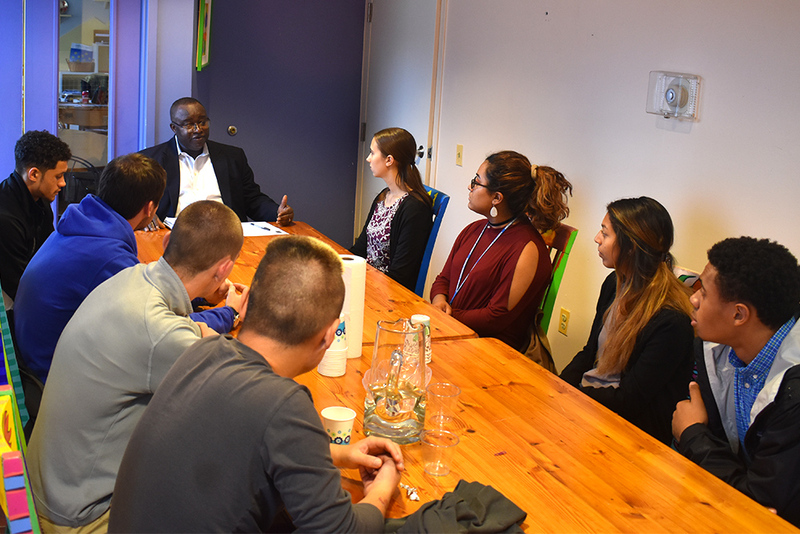 Eight students met with Humphrey Mensah, the chief financial and administrative officer at the Latin American Youth Center. Mensah described his role in managing a nonprofit organization with more than $16 million in annual operating expenses. At the YMCA of Metropolitan Washington, LaShaun Murray described the Y’s various programs engaging youth and the elderly in recreation as well as her career path, working her way up within the organization from a janitor through her position as senior program director. WCSC staff member Karlyn Gehring said that Murray highlighted a work ethic of initiative and perseverance, both for interns at the start of their professional careers and for those in higher positions. “Students gained perspective on what it means to apply the theoretical work they engage in the classroom to real jobs where the specifics of tasks might not be so clear and where creative problem- solving sets employees apart,” Gehring said. Helping to organize and host day-long class field trips is new territory for WCSC, Schmid said. But program staff hope to offer more opportunities in the future to groups from the Harrisonburg campus. “The opportunity to share our connections, inspire students to envision and imagine their future, and consider what they might gain from a semester with WCSC is invaluable to everyone involved,” she said. Professor Andy Miller is coming full circle bringing all these undergrads to DC. He and I shared a group house together in Silver Spring in the early 2000s. Tremendous learning opportunity for our students! Great article.